"Emergence" is a public art project by Jessica Langley and Andy Curlowe commissioned by the Regional Transit Authority in Cleveland, OH. 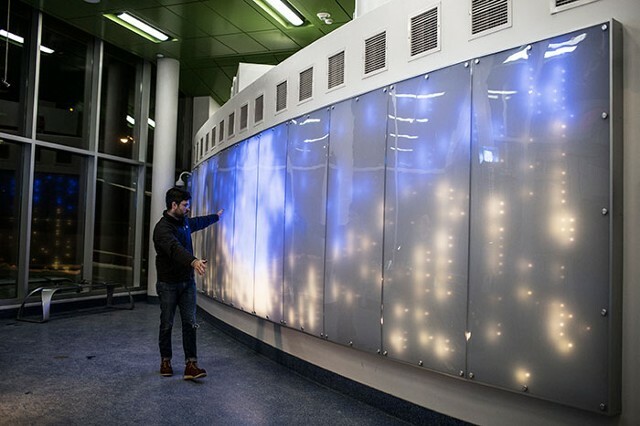 This interactive mural installation is located at the Cedar-University (RED LINE) Rapid Transit Station and is comprised of 11 panels and 6500 LED lights. Lights are illuminated by RTA riders as they pass through the station. With one person, her "shadow" appears in lights. With many people it is possible to illuminate all of the LED lights at once. The two colors (white and blue) reveal the full shoreline of Northern Ohio.